The textiles of mainland Southeast Asia share much of their production technology, design repertoires, and consumption patterns with other regions of Asia to the north (China) and west (South Asia, India), as well as insular Southeast Asia. The student of mainland Southeast Asian textiles must be as concerned with Indian, Bhutanese, and Northeast Indian textiles, and those of Southwestern and southern China, including Hainan Island and aboriginal Taiwan, as with the more traditional areas of the mainland, included in the current political entities of Vietnam, Laos, Cambodia, Thailand, Burma (Myanmar), and peninsular Malaysia. Exploration of continuities and discontinuities between "traditional" Southeast Asia and the peoples, cultures, and textiles of these "peripheral" regions pays great dividends. The migrations of many Southeast Asian cultures began in southern China, and mainland Southeast Asia's major religion, Theravada Buddhism, and its textiles came from South Asia; also, South Asia and China provided royal textiles which became models emulated even in rural Southeast Asia. The region's "traditional" textiles include tube skirts, shawls, blankets, and other items that have as their probable model weaving on back-tensioned looms with circular warps. These can be elaborated in a variety of ways, using resist tie-dyed warp or weft elements, intricate supplementary weft or warp floats, tapestry weaves, appliqués, embroideries, and other methods. Additionally, Southeast Asian textiles include Buddhist monk's robes, developed by the Buddha to contrast with the uncut textile tradition of South Asia, as well as tailored coats, pants, and robes derived from Chinese forms. While it is often asserted that the preservation and recovery of Southeast Asian textiles is hindered by the region's tropical and semi-tropical climate, recent creative archaeological research has filled in some gaps. Fragments of textiles adhering to bone caused by bronze deposition have been discovered in Ban Chiang (Northeast Thai) sites. Innovative archaeological recovery techniques from burials have shown that asbestos was used to make cloth. Finally, Green's (2000) work on Khmer basreliefs used to decorate Angkorean temples shows that these consisted of designs found on Indian block-printed and ikat-motifed cloth also found in Fustat, Egypt. This innovative work shows that earlier eras of textile production and consumption may not be lost. With European contact one begins to gain a more holistic sense of the complex world of mainland Southeast Asian textiles. Unfortunately, most early information is concerned with textile display and consumption within the worlds of Southeast Asian monarchies. Louis XIV's French ambassadors' discussions of their 1685 reception at Ayutthaya (then capital of Siam) show that the extensive use of textiles reflected their reception's significance, as well as designated the ranks of the various people involved in these ceremonies. Many of the textiles sent in return by King Narai were noted as coming from Persia, Hindustan, Japan, and China. This evidenced the cosmopolitan connections of Southeast Asian kingship. Non-Southeast Asian pieces using block-prints and metallic interweave, quite beautiful and sumptuous, served as markers of god-king status and as gifts to subjects to secure their status, roles, and allegiances to the monarchy. The goal of European adventurers and trading companies was to imitate and insert themselves into this lucrative, royally controlled South Asian trade as part of their monopolistic takeover of world trading patterns. However, because of the rigors of Southeast Asian environments, cloth's intensive uses, and the difficulties of production before industrial manufacture, little is known of nonelite textiles prior to the mid-1800s. It is assumed that local production of silk and cotton yarn and trade in this yarn and textiles was a part of local life. Early European explorers venturing into mainland, especially upland, northern Southeast Asia were impressed with the amount of trade with southwestern China in cotton and silk yarn: cotton was traded north, silk came south. Additionally, explorers visiting the royal families of the northern principalities were impressed by the use of Chinese textiles in the repertory, partially to replace textiles traded or granted by kings to the south. Members of the Mekong expedition of 1866-1868 were awed by the willingness of local women to trade homemade textiles for European goods. Finally, in addition to having use as clothing, textiles acted as currency. Careful studies of tax receipts flowing into Bangkok from upcountry dependencies during the early reigns of the Chakri dynasty (1782-c. 1830) show that white cotton cloth was a major tribute item. In part, this cloth was requisitioned for royal funerals; in many Southeast Asian cultures, white cloth is required for wrapping the deceased. For royal funerals, even more was needed to dignify the cremation bier and for participant dress (Lefferts, 1994). 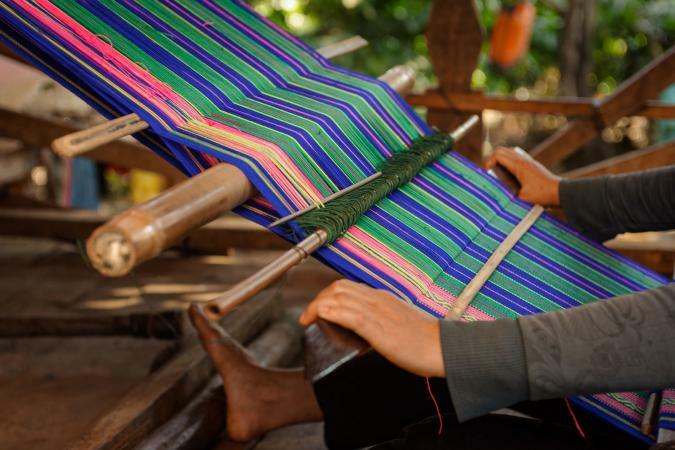 Some upland Lao cultures use magnificent lengths of tiedyed weft silk cloth to adorn coffins. Rural production of Southeast Asian textiles takes place at the household level. It is women's work; women are responsible for growing cotton, raising mulberry trees and silkworms, controlling the production technology, weaving, and, finally, distributing the cloth. However, as the evidence of cloth for tribute indicates, this does not mean that women could engage in this production without elite interference. Bowie has documented that, under rigorous royal control, severe constraints could be placed on local production. In the late nineteenth and early twentieth centuries, it was quite common for northern Thai villagers to wear rags and patched clothing. However, in many other locations, elite control of textile production was probably less severe, laying the foundation for the fluorescence of wondrously woven textiles that came to light in the late twentieth century. Industrially produced textiles, initially from the looms of England and France, but, later production, from pre-World War II Shanghai, South Asian, and American factories, coupled with the intrusion of European tailored clothes, wrought major changes in rural Southeast Asian textile production and urban and rural consumption. Domestic production of white cloth declined dramatically. Rather than remaining a major consumer of a woman's production, white cloth became a residual meant for donation and personal use. 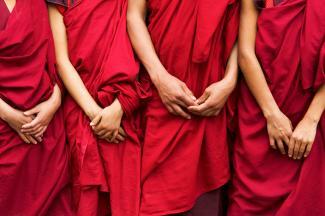 In addition to funerals, a major use was in monk's robes. Cheap, factory-made white cloth, smooth (in contrast with rough home-spun and home-woven pieces), cut, sewn, and dyed the appropriate saffron color, seems to have quickly replaced much of the demand for white cloth produced by rural women. At the same time, white cloth tribute ceased, replaced by government levies for cash to run expanding bureaucracies. Finally, the first chemical indigo dyes produced in Euro-American factories, rapidly followed by the development of other artificial colors, replaced locally produced natural dyes. Brilliant chemical dyes proved a boon to Southeast Asian weavers and consumers who wanted sharp colors that contrasted with the dull dyes they had endured for generations. While there is no secure data, it seems that the period leading up to and through World War II and the following one to two decades resulted in the production of an extraordinary range of indigenous village textiles of complicated designs and patterns, a creative explosion by many accomplished women. These textiles, many used but even more saved for future use, flooded the textile markets of Southeast Asia following the end of the cold war and the opening of transportation and consumption across the whole broad sweep of northern mainland Southeast Asia and southern China. It is fair to say that these textiles represented a culmination of Southeast Asian women's artistic and technological prowess. This was especially the case in the cloth women wove for their own garments, both skirts and sashes. Beautiful tie-dyed patterns dominated in some areas, while in others complicated brocades produced by a loom with a multistrand vertical pattern heddle became common. Finally, in some areas, complicated tapestry weaves and double-warp cloth with supplementary weft became standard. Euro-American and Japanese connoisseurs became aware of Southeast Asian textiles through the dispersal of Southeast Asian refugees fleeing the American-Indochinese War. These groups included highlanders, some of whom, such as the Hmong (Miao, Meo), were relatively recent migrants into Southeast Asia from China; others, such as the Thai Dam and Thai Khaaw (Black and White Thai) and ethnic Lao of Laos, had been wet-rice cultivators resident in their areas for several generations. All were displaced by war and arrived in refugee camps and countries of final settlement with their traditions, homemade textiles, and demands to reinstitute their culture. The evolution of indigenously produced textiles into articles of consumption by neighbors becoming aware of these refugees, such as the "story quilts" of the Hmong and other changes to their design repertory, has been documented by Cohen. 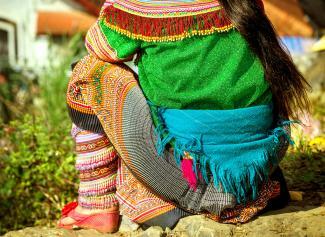 Other weaving traditions, such as that of Lao women in the U.S. and France, have also survived. Several mainland Southeast Asian textile producers have been awarded personal recognition, as, for instance, through the U.S. National Endowment for the Arts National Heritage Fellowship program. Detailed studies of the production technologies of mainland Southeast Asian textiles are now bearing fruit. The relation between the woman producer and her material and equipment is a more holistic one than for the typical Euro-American loom. Usually, the loom itself and much of its equipment is made by a man and gifted to the woman as a mark of respect or an inducement to undertake production, considering that textiles are one of the important ways by which a household may gain supplementary income and prestige. Among some populations, cloth production is magically potent; men are forbidden from touching the loom. A weaver may be viewed as producing a changeable sub-stance, resulting in something of a different quality from that with which she began. Thus, textile production may metaphorically represent a girl's maturation to womanly status, with the ability to bring new humans into the world. In mainland as well as insular Southeast Asia, the means of textile production as well as knowledge of its technology is controlled by women. Women in many Southeast Asian cultures derive symbolic and cultural capital from their control of weaving and the disposition of production. Women's textile production may make substantial contributions to household income. While textile production may vary through the year depending on the requirements and opportunities of other employment, textile production used to be, and, for many women remains, an important skill. At minimum, women can produce cloth for which the household would have to spend precious cash. Most weaving takes place using long warps containing several pieces to be cut off as needed. The weaver can give pieces to various individuals, keep others for future giving, or sell some or all of them as opportunities appear. The opportunity cost of time, coupled with the defrayed expenditures for purchasing textiles and the possibility of income production, thus may make a woman's weaving an essential part of household survival. The global reach of market forces into upland mainland Southeast Asia in the early 1990s resulted in the export of massive numbers of technologically important and aesthetically beautiful indigenous textiles. Most of these left the region without proper provenance or notes as to the uses to which they could be put. Moreover, this export robbed future weavers of pattern cloths of models for future designs and techniques. However, even as commercialization and globalization have conspired to obliterate the indigenous, home-based production of mainland Southeast Asian textiles, countervailing forces have arisen to preserve and record it. Research by Western weavers and by scholars in mainland Southeast Asian textiles is relatively recent, beginning in earnest in the late 1980s. This effort has resulted in detailed studies of textile contexts, meanings, and uses. Importantly, accomplished foreign weavers have become interested in detailed studies of the intricacies of mainland Southeast Asian production technology. Because textile production is a process, these studies must include numerous still photographs or, even better, detailed, focused video. Fortunately, this work is underway and important studies are now appearing. Finally, efforts are underway to conserve some of these traditions. Her Majesty, Queen Sirikit of Thailand, through her royally sponsored Support Foundation (the French acronym for Foundation for the Promotion of Supplementary Occupations and Related Techniques), has, for many years, supported local craftspeople who are expert in modes of production and design. For her pioneering and continuing efforts, Queen Sirikit won an ATA (Aid to Artisans) 2004 Award for Preservation of Craft. In Laos, the Lao Women's Union and private entrepreneur Carol Cassidy are engaged in preserving and expanding the repertoire of Lao weaving and bringing it international recognition. Similarly, in the early 1990s in devastated Cambodia, UNESCO began a massive effort not only to reestablish textile production, but also to reinstitute the cultivation of mulberry trees and silk yarn production to support it. 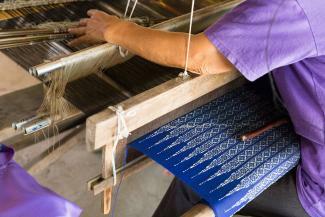 In the early 2000s, some of the glory of Khmer silk weaving is returning. All of these efforts depend on working with local people, usually women, who remember what they accomplished so easily many years earlier, letting them know that their knowledge is of value and encouraging them to share it with others. Most of all, these and other efforts return income to villagers who have begun to see themselves as only poor and without meaningful resources. See also South Asian Textiles; Southeast Asian Islands Textiles. Bowie, Katherine A. "Labor Organization and Textile Trade in Northern Thailand in the Nineteenth Century." In Textiles in Trade, Proceedings of The Textile Society of America Biennial Symposium. Washington, D.C., 14-16 September 1990, pp. 204-215. Analysis of royal control of pre-modern textile production. Cohen, Eric. The Commercialized Crafts of Thailand: Hill Tribes and Lowland Villages, Collected Articles. Honolulu: University of Hawaii Press, 2000. Extensive selection of articles on Hmong textile adaptations to globalization and commercialization. Conway, Susan. Silken Threads and Lacquer Thrones: Lanna Court Textiles. Bangkok: River Press, 2002. Comprehensive discussion of northern Thai royal textile traditions. Gittinger, Mattiebelle, and Leedom Lefferts. Textiles and the Tai Experience in Southeast Asia. Washington, D.C.: The Textile Museum, 1992. Gittinger's chapter 1, "An Examination of Tai Textile Forms," provides a statement concerning the evolution of many mainstream Southeast Asian textiles; her chapter 4, "Textiles in the Service of Kings," provides an excellent summary of royal relations with external textile producers. Lefferts's chapter 2, "Contexts and Meanings in Tai Textiles," focuses on the symbolic significance of women's control of textile production and gifting. Green, Gill. "Angkor: Textiles at the Khmer Court, Origins and Innovations." Arts of Asia 30, no. 4 (2000): 82-92. Howard, Michael C., and Kim Be Howard. Textiles of the Daic Peoples of Vietnam; Textiles of the Central Highlands of Vietnam; and Textiles of the Highland Peoples of Northern Vietnam: Mon-Khmer, Hmong-Mien, and Tibeto Burman. Bangkok: White Lotus. Numbers 2, 3, and 4 in the series Studies in the Material Cultures of Southeast Asia. Comprehensive surveys of little-understood areas. Lefferts, Leedom. "The Ritual Importance of the Mundane: White Cloth among the Tai of Southeast Asia." Expedition 38, no. 1 (1996): 37-50. McClintock, Deborah. The Ladies of Laos. Greenville, Del. : Privately issued. CD-ROM; excellent investigation with slides and video of total textile production process.